Step-by-step instructions for coding in Swift. Is there a better alternative to Swift Cookbook Companion? Is Swift Cookbook Companion really the best app in Reference category? Will Swift Cookbook Companion work good on macOS 10.13.4? Swift Cookbook Companion is the "companion" app to the Swift Cookbook: a carefully compiled collection of more than 340 useful, hand-picked code snippets for Swift 3, all tried and tested, that solve everyday coding problems. 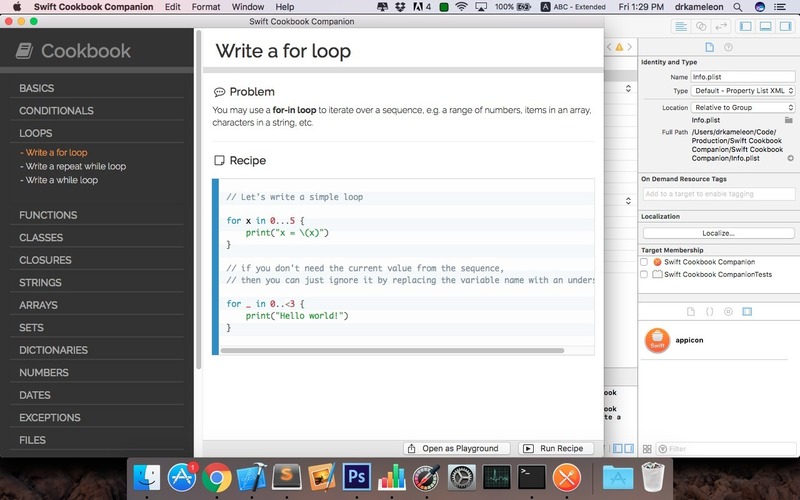 Designed to be easy to use, with step-by-step instructions, suitable both for beginners and the seasoned Swift developers, Swift Cookbook Companion will become your go-to guide for your daily... coding recipes. Swift Cookbook Companion needs a rating. Be the first to rate this app and get the discussion started!